The biggest change in this update by far is a massive iteration on the Diplomacy gameplay. Many of these new features and improvements were things we were planning to do after V1.0 or even drop from the game entirely to get it out the door quicker, but when developing the Diplomacy AI’s Memory system we decided to push ahead with them. You only get one shot to release a game and this was one of our biggest opportunities to do something new and exciting in the 4X genre, so we’re very glad we took it. We posted an update on this to the Steam forum that was positively received, and in particular we were absolutely blown away by follower EVIL’s incredibly kind words below. We hope it lives up to your expectations! This was the final major piece of the diplomacy puzzle for us. It’s taken us some time to get here, but I hope you’ll agree that it was worth the wait! The Coercion panel in the Diplomacy screen is now active and you can use it to add diplomatic threats and demands to your deals that really take diplomacy to the next level. Races will also remember your recent threats and coercions in all future negotiations and will react accordingly. The weightings of threats may be tweaked as we balance test this gameplay, and we’d love to hear your thoughts on it. Threats: Threats are a way to strong-arm another race into accepting a deal that would otherwise be in your favour. They add weight to a diplomatic offer and increase the chance the enemy race will accept, but will cause a -10% diplomatic penalty with that race for the next 100 turns and a minor penalty with the other races. Each threat can only be issued once every 50 turns, so you better make sure you get something useful in exchange. Threaten to Declare War: Threatening to declare war adds value to the diplomatic offer based on how big your military is compared to the enemy race’s (essentially, how afraid of war with you they are). This can be a gamble if the enemy’s chance of accepting the deal is less than 100%, as war will be declared immediately if they call your bluff and reject the deal. Threaten to Cancel Treaty: You can threaten to cancel any Alliance, Research Agreement, Trade Agreement, Sensor Treaty, or Peace Treaty you have with the enemy race. This will add value to the agreement depending on whether or not they get a lot of value out of that treaty. For example, threatening to cancel a peace treaty when your military is smaller than theirs isn’t much of a threat but doing so when your military is stronger will add a lot of weight to the deal. If they reject the proposal, the treaty will be cancelled immediately and you’ll take a diplomatic hit for both making the threat and breaking the treaty. Coercions: Coercions are demands you can make other than just money and technologies, and are a great way to manipulate the other races. You can diplomatically isolate a race by convincing everyone to break their treaties with them, for example, or convince a warmongering race to lay off an ally of yours they’re at war with. Demand They Break Treaty: If the enemy race has any treaties with other races, you’ll be able to see them all here in the Threats & Coercions tab and can demand that they break those treaties. You’ll have to offer them something substantial in exchange or make a sufficiently large threat to make them agree. For example, you could bribe The United Colonies with a few technologies to break a Research treaty they have with the Z’loq or threaten to cancel all of your treaties with them if they don’t break off a Peace Treaty with the Kazzir. Demand They Stop Spying: If the enemy race has any active spies in your planets, this Coercion option will show up in the Threats & Coercions tab in the diplomacy screen and will let you know how many spies they have in your empire. This is a simple demand that the enemy stop spying on you, which will make them set all of their spies from active missions to the inactive “Hide” mode for the next 100 turns. Demand They Make Peace With Someone: If the enemy race is at war with another race, you’ll be able to demand that they make peace with them. If they agree, they’ll attempt to contact the other race and make a peace offering within several turns (except during the first 10 turns after a war declaration, when diplomatic contact is cut off). There’s no guarantee that the other race will accept their peace offer, but they will make what they consider to be a reasonable offer. If you can convince both sides in a war to make peace, a peace treaty is guaranteed to be signed. We’ve also added a new Peace Mediator technology that gives you a global +10 diplomatic boost with all races for 100 turns every time you mediate a peace treaty in this manner, so you can keep the whole galaxy at peace if that’s your plan. Star Claims: Every fully uninhabited star system you’ve been to that has planets will show up in the Threats & Coercions tab, where you can issue a demand that the other race respect your territorial claim to it. Claim Star System: If you can get a race to agree to this demand, they will not send any colony ships to planets in that star system. Any colony ships that are already on their way there will not colonise on arrival and will soon select a new planet to colonise. Your claim is valid for 50 turns only and counts as a minor diplomatic threat, so it will carry a small diplomatic penalty for that 50 turns. AI Star Claims: If the AI is thinking about settling a planet in an uninhabited star system and it’s in your sensor range too, it will sometimes contact you to declare a claim on the system. Sometimes they’ll just issue the claim as a demand and sometimes they’ll include minor inducements like free money to convince you to accept. You can either accept the claim (which will of course make them like you more) or reject it and maybe try to grab the star for yourself. It’s also perfectly possible to accept a claim and then violate it by colonising a planet in that star system anyway, but this will cause a diplomatic penalty with the other races that they’ll remember for quite a long time. The old diplomatic favour system had a point scale running from 0% to 100% representing how much each race likes you, and events such as wars or giving them gifts would permanently increase or decrease this rating. In practice, this meant you could just give an enemy race a bunch of gift technologies and they would like you forever unless you did something to decrease your rating again later, and they would never consider going to war with you. In the new favour system, everyone starts with 50% favour to each other and this is modified based on your recent diplomatic history with the other race. Every time you do something that could change to your favour rating with another race, such as launching a surprise attack or giving them a technology gift, it’s recorded in that race’s list of AI Memory events. The value of each event decays slowly over around 100 to 200 turns, so you can’t just give them a gift once and coast on that goodwill forever. Decay also solves a problem in some other 4X games where empires can hold ancient grudges for the entire game even when it no longer makes sense. Positive memory events: Making a good impression in first contact, making fair deals, offering gifts, current treaties, and accepting the other race’s proposals. Negative memory events: Making a poor impression in first contact, proposing unfair deals or demands, breaking treaties, launching surprise attacks on their planets without declaring war, using biological warfare, using weapons banned by the Galactic Council, mistreating your citizens (e.g. 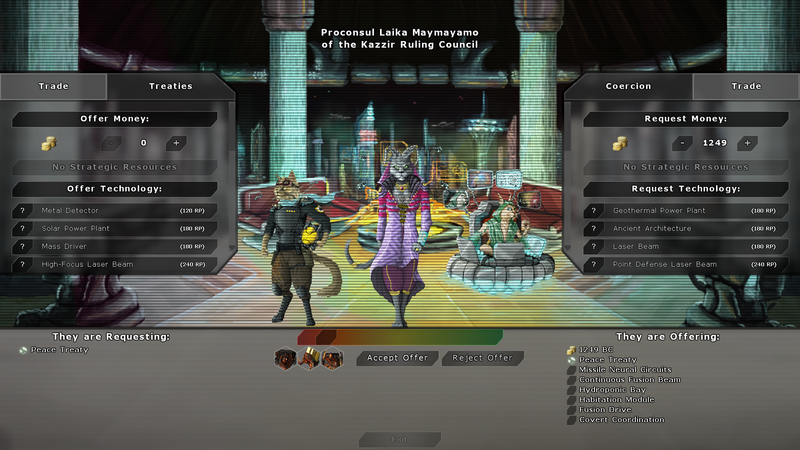 picking a violent resolution to a riot random event or researching the Medical Testing technology), your spies on their planets being caught, violating a star claim agreement, and recent diplomatic threats made against them. The Diplomacy AI now periodically checks if the other empires in the game have something they want and constructs a diplomatic offer to try and get it. It will now trade for key technologies, barter any strategic resources it has for something worthwhile, and offer treaties when it’s advantageous to its empire. The AI will seek peace treaties and eventually alliances with empires that have powerful militaries, sensor treaties if it will help them expand their empire, and research and trade treaties with large enough friendly empires. This new part of the diplomacy AI is influenced by the empire’s overarching strategic goal (Expand, Consolidate, Diplomacy, Defend, or Conquer), the randomly selected leader’s personality type, and your diplomatic history with the target race (e.g. if you have a reputation for breaking treaties). This means a race’s diplomatic strategy can naturally vary from game to game and depending on its situation. We’ve also implemented a new twist in the form of hidden pre-existing diplomatic motivations. Scientific Advisor: This advisor evaluates the current diplomatic offer on the table and give you the estimated value of each side, a percentage chance that the other race will accept the deal, and a text recommendation. Diplomatic Advisor: This advisor gives you a breakdown of your current favour rating with the other race, showing the total contribution from each type of memory event and other factors such as legendary commanders and racial bonuses or penalties. This is a good way to see what the consequences of your actions are and keep track of grudges races still hold for your prior actions. 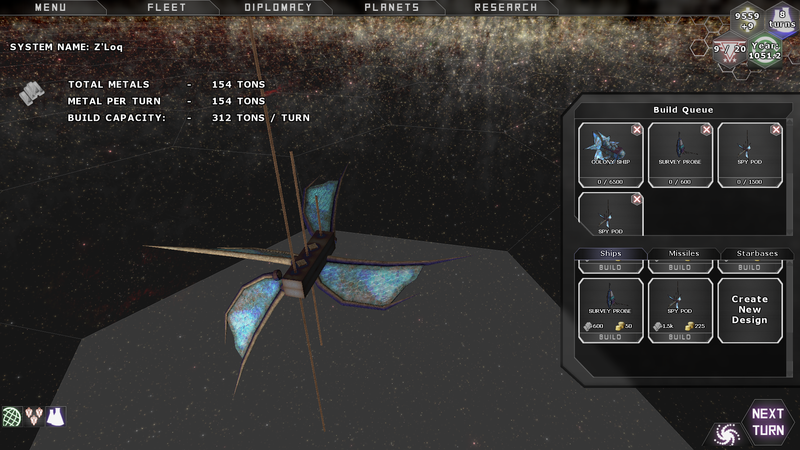 Military Advisor: This advisor gives you the estimated military strength of both races’ fleets and planets. Comparing these is a handy way to see how likely they are to accept a Peace or Alliance treaty, and how much weight they’ll give to threats of declaring war etc. This advisor also tells you the race’s current strategic goal (Expand, Consolidate, Diplomacy, Defend or Conquer), which will also affect how they value certain diplomatic offers. New Deployment System: To install a spy in an enemy planet, you previously had to build a ship with at least one Spy Pod module, fly it to the enemy system, pay 100 BC to install the spy, and then fly the ship home to refill it with new spies. The new system is much simpler and more consistent with the rest of the game. Now you just build single-use Spy Pod probes that work a lot like survey probes, fly them to the enemy system, and install the spy for free. The probe shows up as a Survey Probe on enemy sensors so they don’t know it’s a spy, and you may find it very suspicious if an enemy race starts sending survey probes into your systems. Spying AI: The enemy races now build spy probes once they are able, pick out ideal target planets to install spies in, and send spies to infiltrate them. When spies arrive, the AI gets them to hide for a while to get their infiltration ratings up and then switches them to another mission. The AI picks which mission to use based on factors like how much they like the other race, how much research and other activity is happening on the planet, and whether they’re at war. If you threaten the AI to stop spying on you, they’ll put all of their spies on your planets into hiding until the threat expires. Hide: Passive is +1 infiltration rating each turn for all spies on the planet. Active mission is a chance every 40 turns to make contact with criminals on the planet, increasing the infiltration rating of all spies on the planet immediately by +50%. This mission has a base success bonus of +50 (very low chance of being caught), costs nothing, and is the default mission. 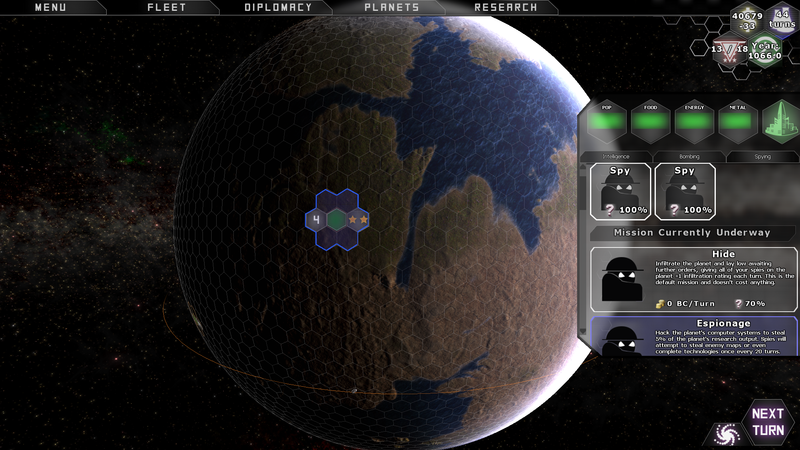 Espionage: Passive steals 5% of the planets research output and adds it to your own empire. Active mission is a chance every 20 turns to steal important data from a computer system, from planetary maps and more research points to full working technologies. This mission has a base success bonus of +20 and costs 2 BC/turn. Sabotage: Passive reduces security coverage by 8,000 population, which can bring the planet’s security rating down below 100%. 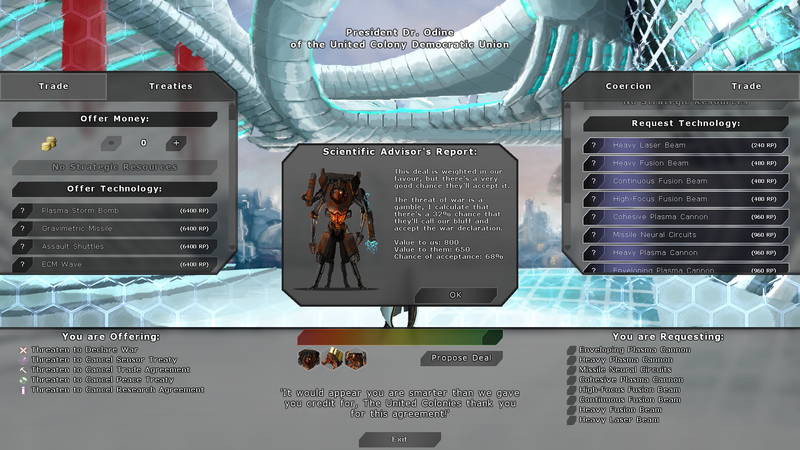 Active mission is a chance every 20 turns to shut down the planet’s farms, factories, or research labs for 10 turns. This mission has a base success bonus of +30 and costs 1 BC/turn. Terrorism: Passive kills 50 population each turn on the planet. Active mission is a chance every 20 turns to blow up buildings, infrastructure, ships in orbit, the space station, or even a whole city. This mission has a base success bonus of +50 and costs 1 BC/turn. Rebellion: Passive reduces the planet’s morale by -40%, which can bring it below 100% and may cause riots and other random events. Active mission is a chance every 20 turns to organise a riot that will cost the enemy money or permanently reduce the planet’s morale rating, making it easier for ground troops to capture. this mission has a base success bonus of +30 and costs 2 BC/turn. Assassination: Passive reduces the enemy’s planet leader bonus by 50%. Active mission is a chance every 20 turns to assassinate the planet leader. This mission has a base success bonus of +0, costs 2 BC/turn and can only be used on planets with an assigned planet leader. 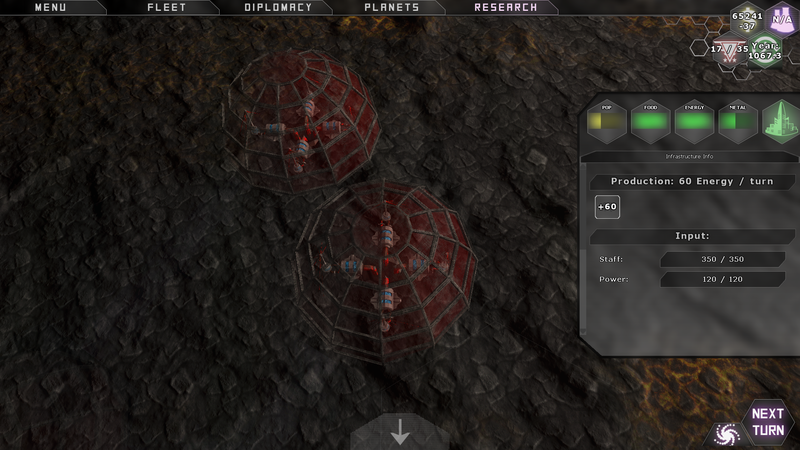 New Spy Technologies: While implementing the new spy missions, we split the Troop Pods and Spy Pods back into two separate technologies and added several new ones to the Sociology tree. We’re planning to add a few more in the next update, so we’d love to hear any ideas you have for new spying technologies! Covert Coordination: Developing a system for coordinating the covert actions of your deployed spies allows you to add an extra spy to each enemy planet. Each additional spy on a planet contributes up to a +10% bonus to the success chance of missions depending on its infiltration rating. Deep Cover: Spies can be trained to prepare additional cover stories and false identities for any new operatives that will land on the planet. Spies will gain +2% infiltration rating per turn instead of 1%, and all spies deployed to a planet will share the same infiltration rating, drastically cutting down on infiltration time. Up until now, the main menu screen has been a simple background image with a few buttons on it. It wasn’t very visually appealing, you couldn’t edit any of the game options from it, and the only way to load a game was to use the Continue button that loaded your latest save game. There was also no way to select the singleplayer mission you wanted to play, which will be important as we add further chapters to the story. I’m happy to say that we’ve now totally revamped the main menu to solve all of these issues, and the new screen very closely resembles the mock-ups from the previous dev update. Visual Update: The screen now looks more appealing, with an animated rotating galaxy on the left hand side and a randomly generated planet on the right. We’re considering adding some kind of clouds to the planet to make it more animated, but this is of course a low priority. Options Menu: A new panel appears in the middle of the screen when you hit the Options menu, with a number of toggleable checkboxes and sliders for things like volume. These are all actually pulled directly from the Menu dropdown in the main game, so if we add new options there then they’ll also appear in the main screen options panel. 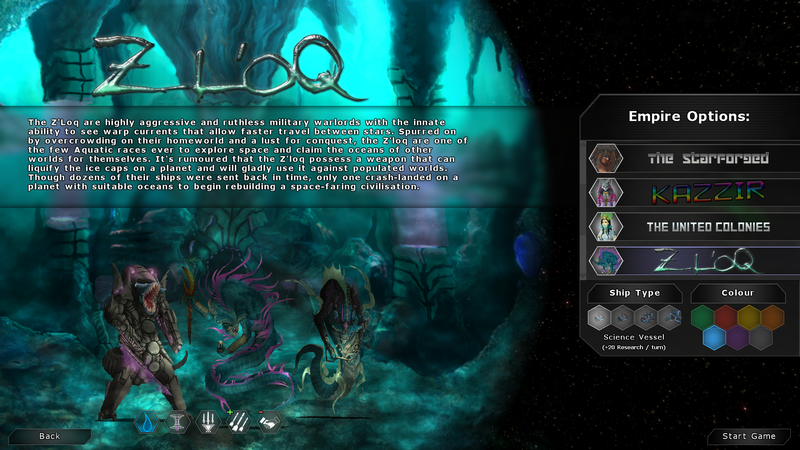 Load Game: The new panel is also used for the Load Game panel, which shows all 8 save game slots and the Autosave in slot 9. The old Continue option has been added here with your latest save game being drawn in slot 10. Each save slot also shows the races in the game next to it, with eliminated races marked off. 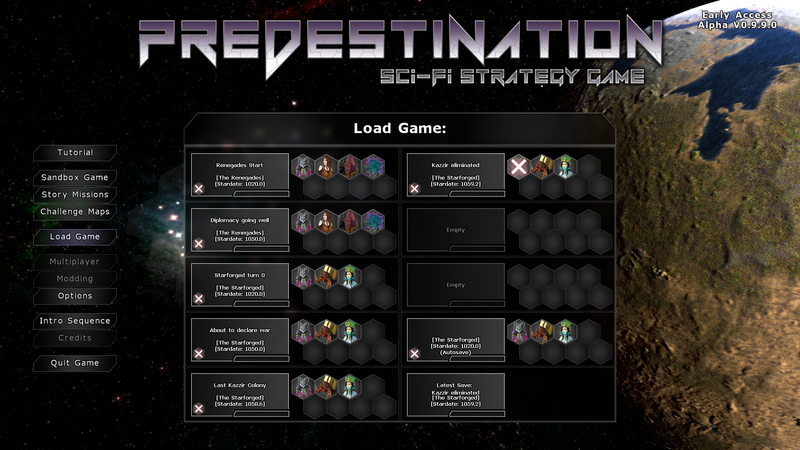 Story Missions: The new panel is similarly used to show a list of all of the singleplayer Story Missions in the game and let you launch one. 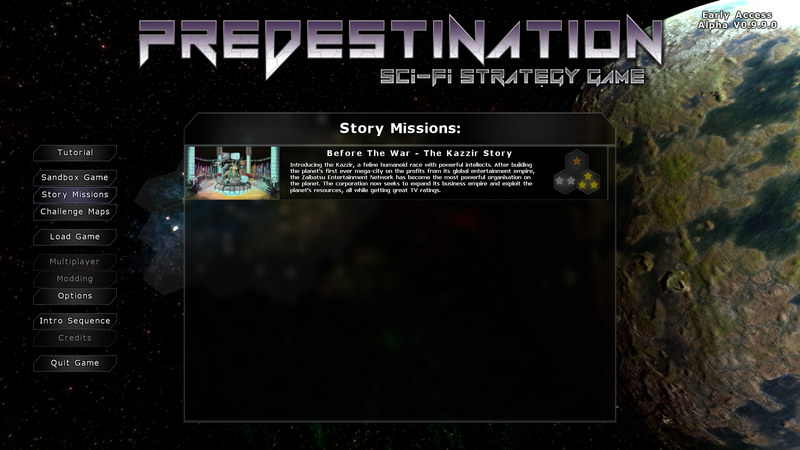 There’s currently only one mission (The Kazzir Story, part of the Before the War story arc), and we’ll be adding more as quickly as possible. The aim is to hopefully have two full story arcs with 6 missions in each by launch. We’ve also added three rating stars to each mission on this part of the UI (Bronze, Silver and Gold), and in a future patch we’ll have a score screen after each mission to work out how well you did and let you know which of the three ratings you achieved. At the moment, completing the mission just assigns you the bronze rating. Challenge Maps: We’ve activated the Challenge Maps button, which uses the same UI as the Story Missions panel, but there are no challenge maps currently available. We’ll be adding some of these leading up to release and after release, and they’ll have the same three star rating system. Science Vessel: Generates 20 RP/turn. On reaching the Space Exploration tech era, you unlock the Orbital Scanner ship module and get a Science Vessel that can scan planets. Asteroid Miner: Generates 25 Metal/turn. On reaching the Space Exploration tech era, you unlock the Asteroid Miner ship module and get an Asteroid Miner ship that produces +50 metal/turn. Colony Ship: Provides housing, food, health, and security for 2,000 additional population. On reaching the Space Exploration tech era, you unlock the Colony Module ship module and get a Colony Ship that can settle another planet. War Cruiser: Provides 50 Energy/turn. On reaching the Space Exploration tech era, you unlock the Laser Cannon, Laser Rifle, Mass Driver, and Electron Shield technologies and get a prototype warship with no FTL drive that can defend your home system and remains quite powerful into the mid-game. Galaxy Distribution: We’ve made some changes to the galaxy and nebula generation algorithm again, making stars a bit closer together and re-balancing the number of stars on each size level (32 for Tiny, 48 for Small, 64 for Medium, 96 for Large, 128 for Huge, and 180 for the new Colossal size). A few tweaks have been made to ensure every race has a certain minimum start quality, so races such as the Starforged and the Zloq who are highly sensitive to finding the right type of planet nearby should no longer get screwed over by map generation. You’ll still have to go exploring to find the ideal planets, but there’s now guaranteed to be a decent one nearby. 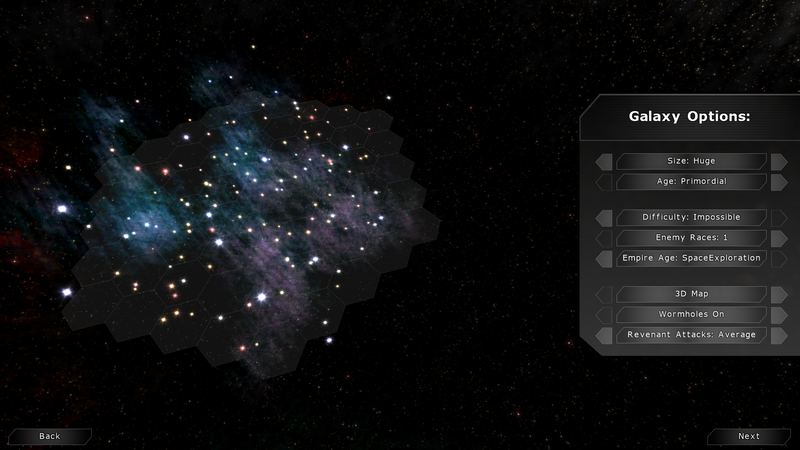 Nebula Tweaks: The nebula graphics have been tweaked a bit and should now look a bit better with more variation. Stars will also now more accurately detect that they’re inside a nebula and show that visually in the system window correctly, which will be a bigger deal as we add further gameplay differences for stars inside nebulae such as gas pockets during fleet combat. The Primordial galaxy age also now makes nebulae sprawl out across multiple stars for a more unique look, and Ancient galaxy age has more distinct nebulae. Aquatic Race Tweaks: Someone pointed out that the Zloq can be kind of overpowered when it comes to producing metal as their Metallic Coral Reefs are massive and can harvest ore deposits on nearby land, so we’ve re-balanced reefs a little. They can still harvest ore on land, but pure Ocean worlds now start with less ore and Aquatic races can no longer research Carbonide Drills so their ore deposits are only worth +2 metal/turn. To compensate, the Metallic Coral Reef now automatically plants 4 additional coral deposits in ocean hexes in their area when built or 9 new deposits with the Pre-Seeded Reefs technology. This also applies to Fishing coral Reefs, which now start with additional fish deposits so you will no longer have to wait as long for fish growth. Standalone Ship Designer: As part of the 3D Ship Designer Kickstarter campaign, we offered a standalone version of the 3D ship designer that let you save your designs to files. We deployed the first version of this last month and will be deploying an updated version soon and sending everyone out emails with the link. Building Models: We’ve now added the models for the Coral Spire, Fishing Coral Reef, Metallic Coral Reef, Gas Harvester, ByteCoin Miner, Antivirus Tower, The Forge, and Heat Sink infrastructure / buildings. Several are still remaining to be completed, including the Factory, Research Lab, Food Processor, and Factory. We’ve also now added the models for biospheres, making it a lot easier to see which cities and infrastructure have biospheres and thus cost an extra +1 BC/turn to run. More Diplomacy Text: As part of this update, we had to add new diplomatic responses for each race to cover new circumstances that can occur. The races all now have responses for when you accept a counter-offer they make, when you accept a deal they spontaneously suggested, when you reject a deal they spontaneously suggested, when you reject a demand they make of you, and when they catch your spy on their planets. We’ve also taken the opportunity to fix a number of text errors in the diplomacy text files. I’d like to thank everyone for reading through another colossal dev update article, I didn’t quite realise how much was in this patch until writing this up! A special thanks also to those providing feedback and bug reports during Early Access. As always, if you’re a Kickstarter backer and you’d like an early access key for Steam or to check out the latest DRM-free non-steam edition of the game, send us an email to earlyaccessrequest@brainandnerd.com with the email address you used on Kickstarter. The next wave of keys will be going out in the next day or two. We’re eagre to get feedback on all of the new things in this update, so please do share your thoughts here, on the Steam forum, or directly via email to brendan@brainandnerd.com if you’d like to keep your thoughts and ideas private. Are the new threat and coercion options too heavily weighted or does the AI still drive a hard bargain? We’re also interested in any ideas you might have for new spying technologies and potentially for new endgame technologies and weapons in the Physics and Biology tech trees. The next major update will be the big V1.0 release, when we change gears from feature development to iteration and balancing. More information on what you can expect in V1.0 will be released in a further dev preview article soon! 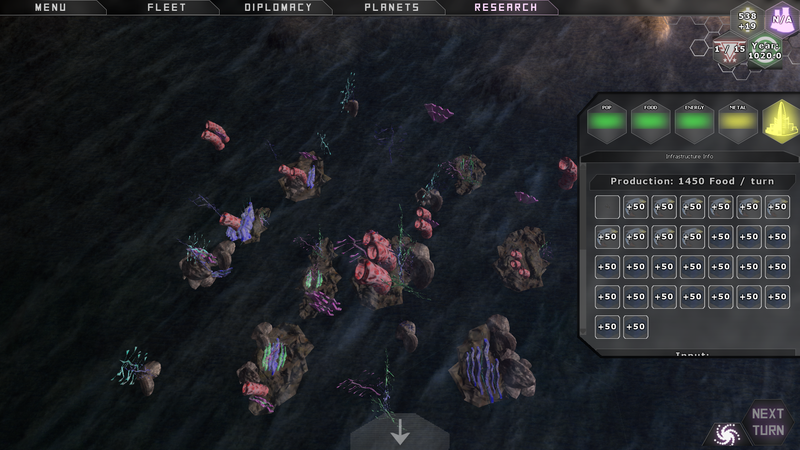 Tagged 3d, 4x, alpha, art, brain and nerd, coercion, colonisation, combat, devblog, development, diplomacy, early access, galaxy, game, game development, game-design, gameplay, gaming, graphics, indie, indie game development, master-of-orion, micromanagement, moo2, planet, planets, predestination, predestination game, race, races, sci-fi, screenshot, screenshots, ship-designer, ships, space, steam, tactical-combat, threats. « Dev Update: Dropdown menu tools, custom starbase designs, UI updates and graphical improvements live! More to come!